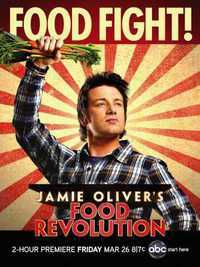 Jamie Oliver's Food Revolution (retitled Jamie's American Food Revolution in the United Kingdom) was a television series on ABC from March 2010 until summer 2011. The show was produced by British chef Jamie Oliver and Ryan Seacrest, following Oliver as he attempted to reform the US school lunch programs, help American society fight obesity and change their eating habits in order to live healthier and longer lives. This webpage uses material from the Wikipedia article "Jamie_Oliver%27s_Food_Revolution" and is licensed under the GNU Free Documentation License. Reality TV World is not responsible for any errors or omissions the Wikipedia article may contain.